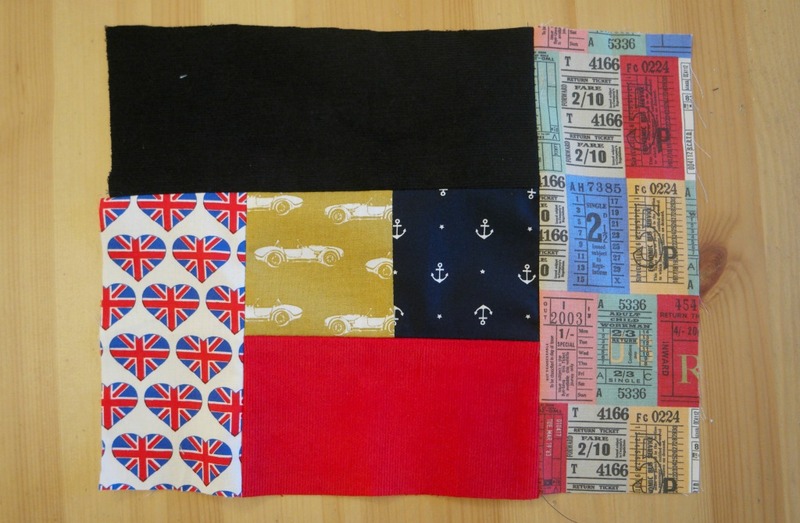 Making bunting isn’t especially difficult, but there are several ways of going about it. Some ways are more time consuming than others. Taking your time over it is fine if you’re only making a bit, or if you need it to be special. One of my favourite bits of bunting I’ve made is this with the trees . Although it didn’t take an age to make, it did take a little while! I made the templates for the trees, backed the fabric with interfacing, cut everything out, appliqued the trees to the flags, sewed the flags up then sewed the flags to the bias binding. I love my tree bunting and it lives in my kitchen! If you need to make a lot of bunting, or if you just want to make some quickly to put up in the garden (or on the front of your house to distract attention away from peeling paint! ), then you need a plan for getting it done with the minimum amount of faffing about. So here’s the easiest bunting tutorial ever! 1. Make your template. Once you’ve printed it out, you could stick it to a piece of cardboard. This will make it easier to cut round if you’re using a rotary cutter. There are bunting templates here. 2. Cut your fabric into strips the same width as the the length of the flag. 3. Line the top edge of the flag up with the top edge of the strip. 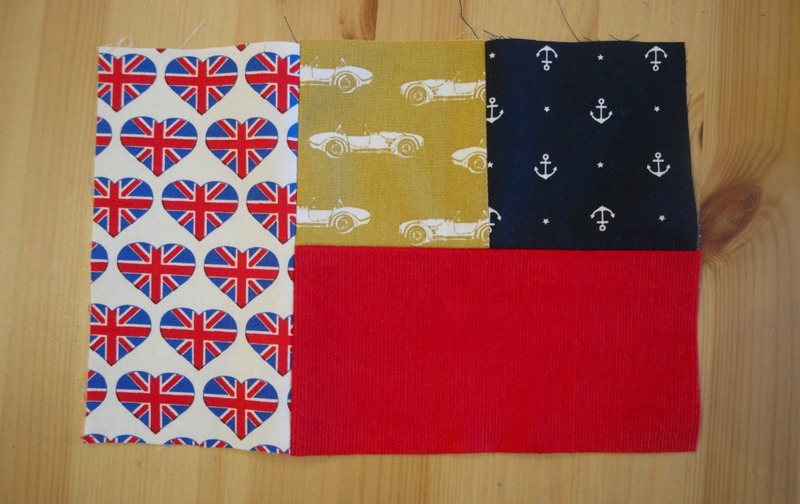 Now fold the strip so that you end up with several thicknesses of fabric the same width as the top of the flag. Keep the fabric folded. Don’t cut it into squares! 4. Cut the fabric along the sides of the template. You’ll find that as well as the flags in the centre, you’ll have some extra ones at the sides too. 5. Take your bias binding and unroll about a metre. Fold it half lengthways and press it with your finger. 6. Leaving a bit free at the end for tying (15 – 20 cm or 6 – 7″ is probably enough), slip one of the flags inside the bias binding and pin it. Start sewing from the end of the bias binding, keeping close to the open edge. 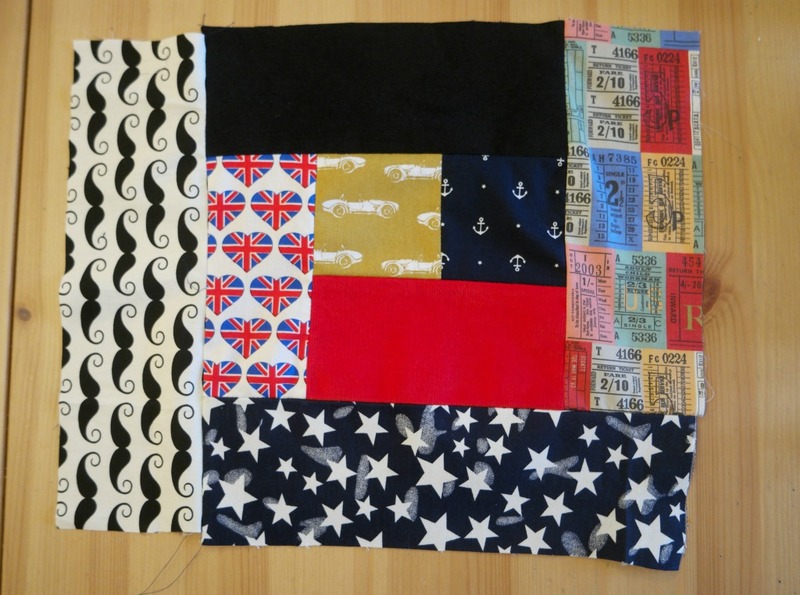 Keep sewing the bias binding past the flag. 7. Leave a bit of a gap (keep sewing though!) then slip another flag in. You’ll have to stop every so often to fold the bias binding in half, but I do this while sitting at the sewing machine. Keep going until you run out of flags or bias binding! 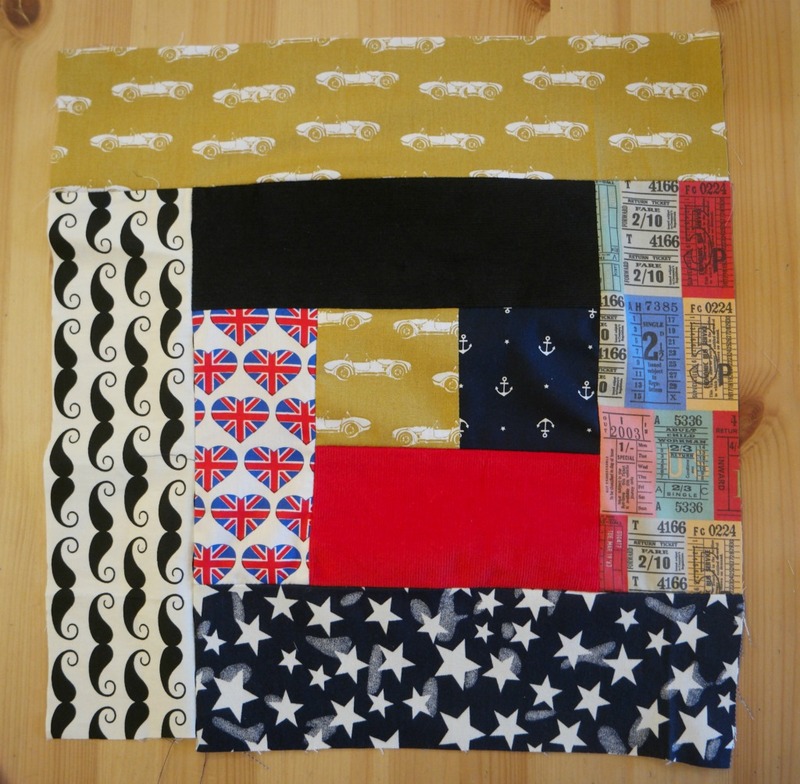 You can use fabric you have already, but if you’re worried about colour combinations, you could use a fat quarter pack. You’ll only get about 8 flags out of a fat quarter though. If you are using fabric from your hoard and you’re not sure about choosing things that go together, pick a favourite print, then choose some plain fabric, spots and/ or checks in similar colours. If you’re concerned that the fabric might fray badly, you could iron on some fusible interfacing first. 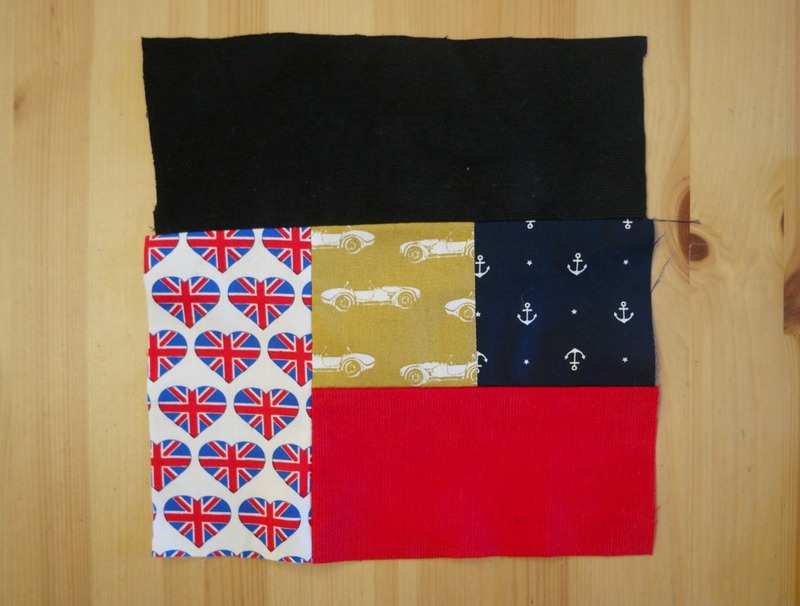 Using a fabric with a directional print will mean that either some of your flags will be upside down, or you’ll have to discard the upside down ones. Non directional prints are better for this. Polycotton works just as well as cotton as you’ll be unlikely to be washing it very much. It’s also cheaper and less likely to fray. I’ve been planning to make quilts for my boys for ages, and before Christmas I finally got my act together and started on the first one. Having the attention span of a gnat (I’m really starting to think I might have an adult version of ADD! ), it’s necessary to keep things as simple as possible or the quilt will end up on the pile of unfinished projects. So instead of making dozens of tiny blocks, I’m making 12 big ones. Not wanting to mess it up, I planned out what I was going to do before Christmas. 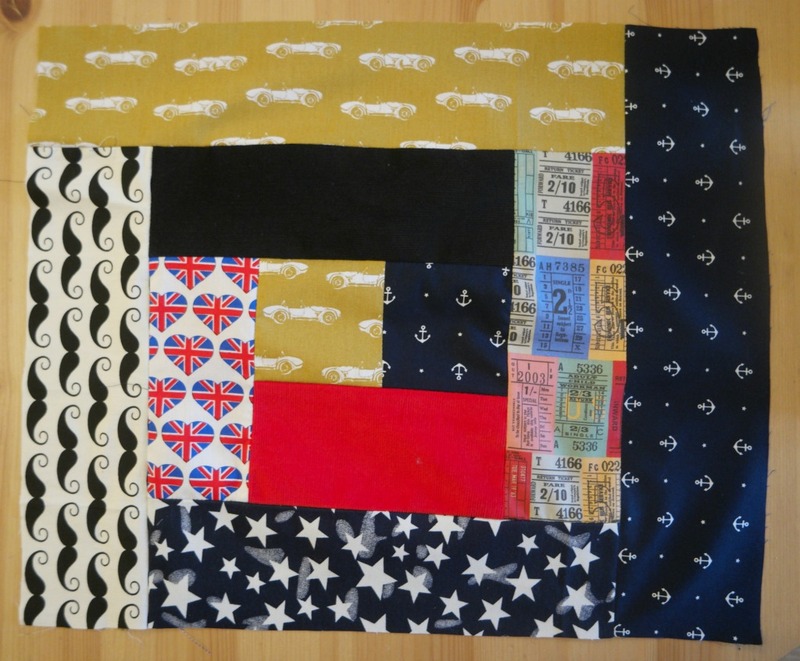 If you’d like to read about planning a quilt, you can find that post here. As well as using large blocks, I’m also planning to back it with fleece and not actually quilt it all. I know this is cheating! But in the end, I want Dominic to have his quilt and I also want to keep my sanity. Now all the bits are cut out and I’m ready to start sewing! 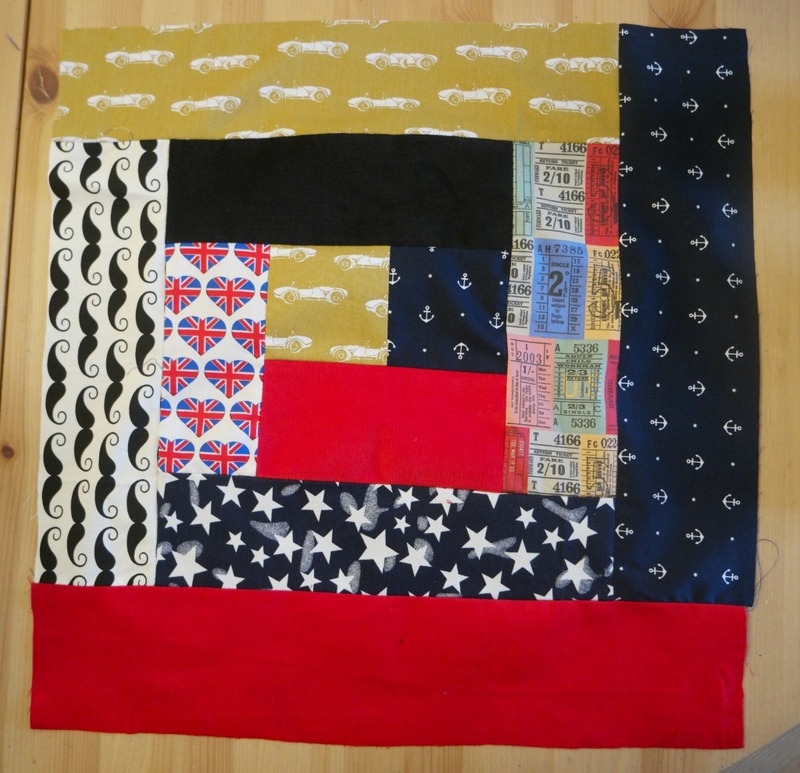 The log cabin quilt block I’m using is made up 13 pieces, 7 different pieces in total. During the planning stage, I worked out how many of each piece I would need. Pieces 1 and 2 are the same, as are 3 and 4, 5 and 6, 7 and 8, 9 and 10, 11 and 12. So that’s 6 different sized pieces, plus the 13th. For those 6 pieces, I cut 24 of each, and 12 of the 13th piece. Here’s a table showing the sizes for each piece and how many you need. 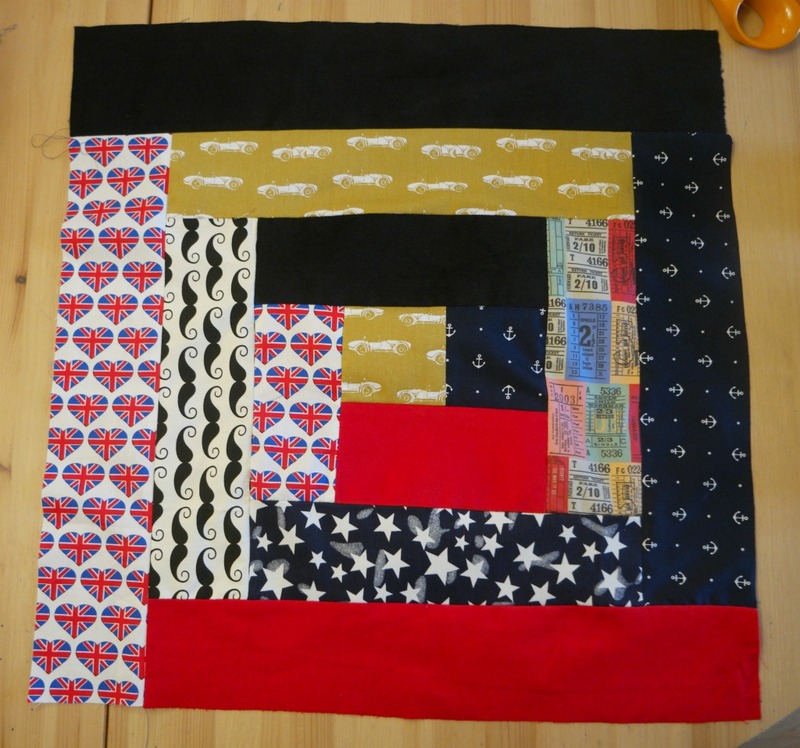 To sew the log cabin quilt block, you start in the centre and work outwards. Pieces 1 and 2 are the same size, so take 2 of the smallest bits and sew them together. Trim the seams and press them open. Then along the lower long edge, sew one of the second size. Then sew the other piece this size at right angles to it. Pieces 5 and 6 are the 3rd size up. 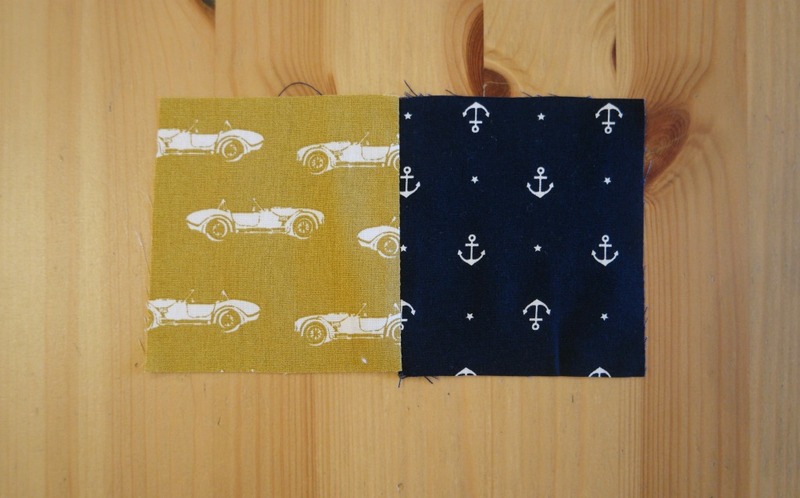 Sew one of these along the opposite long edge to piece 3, and the other one to the side opposite piece 4. Keep going like this so that you’re making up your block in a clockwise direction. You could go anti clockwise if you prefer, but it will look better if you don’t change your mind half way through! Remember to trim and press seams as you go. And if you find that the pieces aren’t quite the right size, you can trim them down. Just be aware that the blocks will be easier to sew together if they’re the same size! The next post will be showing how to sew the log cabin quilt blocks together and sewing the backing. One of the things that has been on my sewing to do list for several years is to make quilts for my boys. My boys like wrapping themselves up in blankets when they’re at home, especially in the evening when they’re watching Canada’s Worst Driver or Mythbusters. I also like the idea of them having something special to take with them when they eventually leave home. The problem with any kind of big project is that it can seem so big, it never gets started! Even the idea of breaking things down into bite sized chunks can be overwhelming because they are just so many chunks! A traditional patchwork quilt made up of lots of little squares definitely falls into this category! 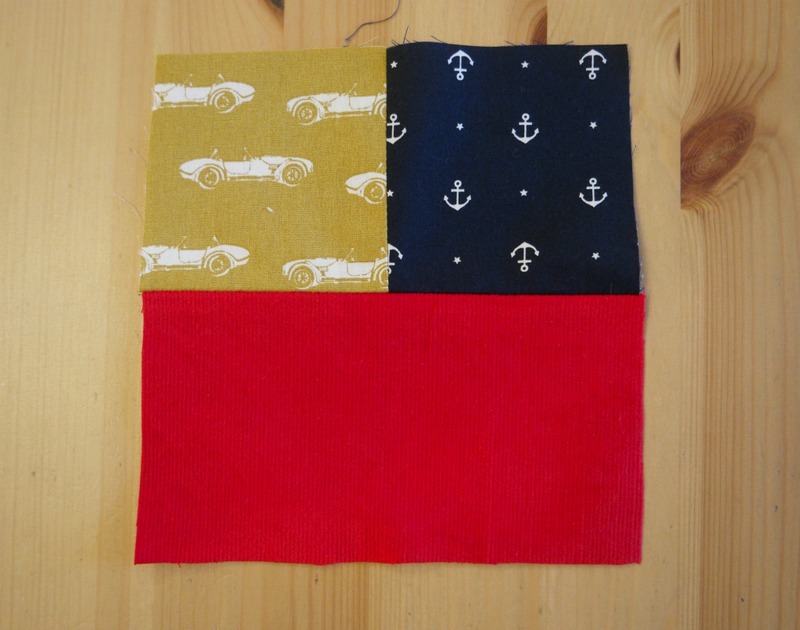 So if I’m going to make quilts for my boys, I’m going to make things as easy as possible. I have a standard sewing machine, not a quilting one, and I also have the attention span of a gnat (although it’s improved a bit), and a pile of unfinished projects to prove it! I don’t want the quilts to end up on that pile! So I’ve opted for large blocks and I’m going to back it with fleece fabric and not actually quilt it at all. I know this is cheating! This is not my idea. It is one I have shamelessly stolen from Sara at Creative Jewish Mom. You can the quilt she made here. Anyway, I’ve got the fabric, and before reaching for the scissors and making a dreadful mess of everything, I’ve planned out what I’m going to do. This way, I know exactly how many blocks I need to make and how wide the strips need to be before I start cutting. 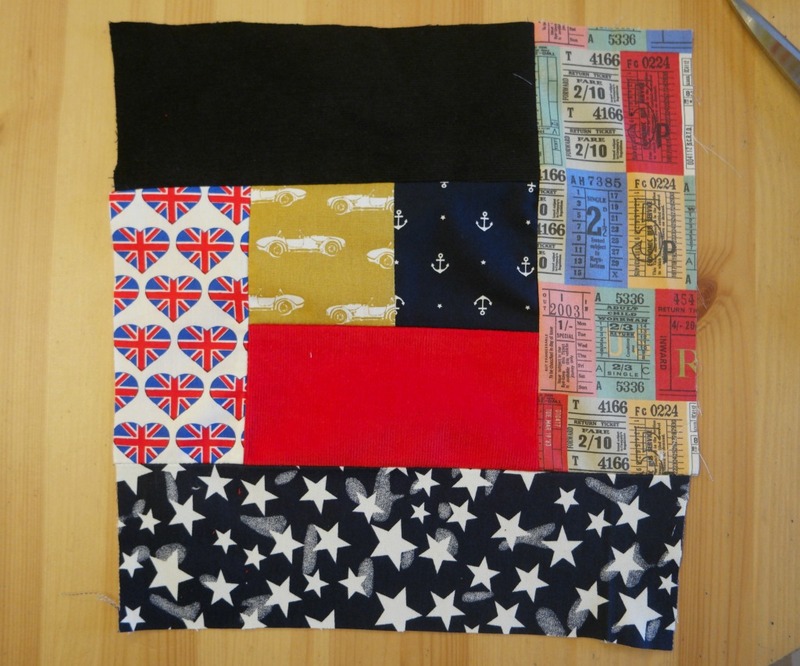 Here’s how to plan a patchwork quiltl! 1. Once you’ve decided on a quilt block, the next decision to make is how big you want the quilt to be. I wanted mine to be a little bit wider than a single duvet and about the same length. A vague idea is all you need here, as the actual finished dimensions will depend on the size of the blocks. A single duvet is 135 cm by 200 cm, so I was aiming for about 150 cm x 200 cm. 2. The next thing to decide is how many blocks you want the quilt to have. I decided to make big blocks, as that would be less work, easier, quicker, and I’d be more likely to finish it! I decided to make my quilt 3 blocks by 4, with the option of a border if the measurements required it. 3. The next part is tricky, as this involves figuring out how big each block needs to be. So that it doesn’t get horribly complicated later on, the actual dimensions of each block need to be determined by the size and shape of the pieces that make them up. This where keeping things simple is really going to help! 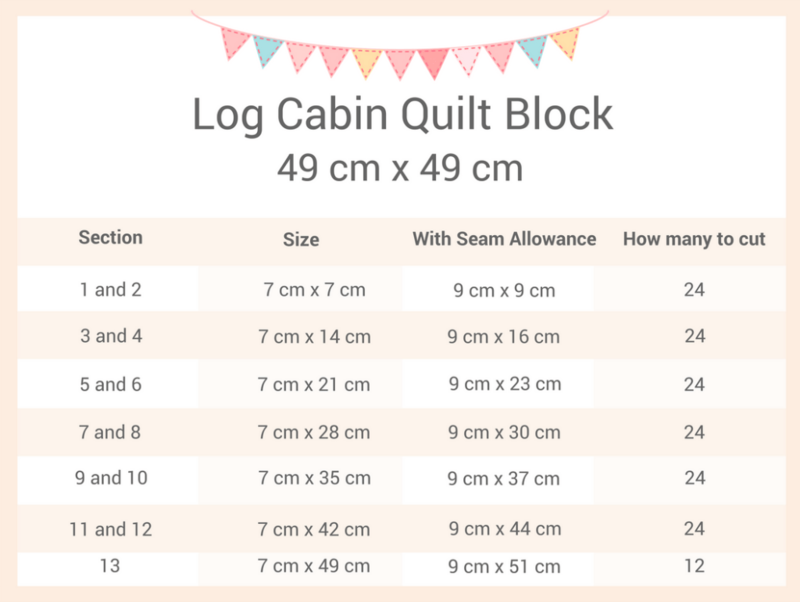 The quilt block I’ve chosen for my patchwork quilt is a simple log cabin. All the rectangles are the same width, and there are 7 rectangles going across and 7 going up and down. So the easiest thing is to start with a number divisible by 7. A square 49 cm x 49 cm would result in quilt without borders measuring 147 cm x 196 cm. That’s close enough for me! 4. The next task is to work out exactly how big the pieces need to be. You can do this either by drawing it out on a large sheet of paper, or by working it out. Don’t forget to add a seam allowance! With the log cabin block, the 1st 2 pieces are squares, so they would need to be 7 cm x 7 cm. Adding a 1 cm seam allowance all the way round makes them 9 cm x 9 cm. Pieces 3 and 4 need to be 7 cm wide and the same length as the first to pieces combined, so 7 cm x 14 cm. A seam allowance makes them 9 cm x 16 cm. Pieces 5 and 6 need to be 7 cm wide, then as long as three sections, so 21 cm. With the seam allowance, 9 cm x 23. You get the idea! Here’s a table with the measurements of each section. 5. With the pattern pieces made, identify how many of each piece you will need. Decide how many you will cut from each fabric. 6. Now cut the bits out! 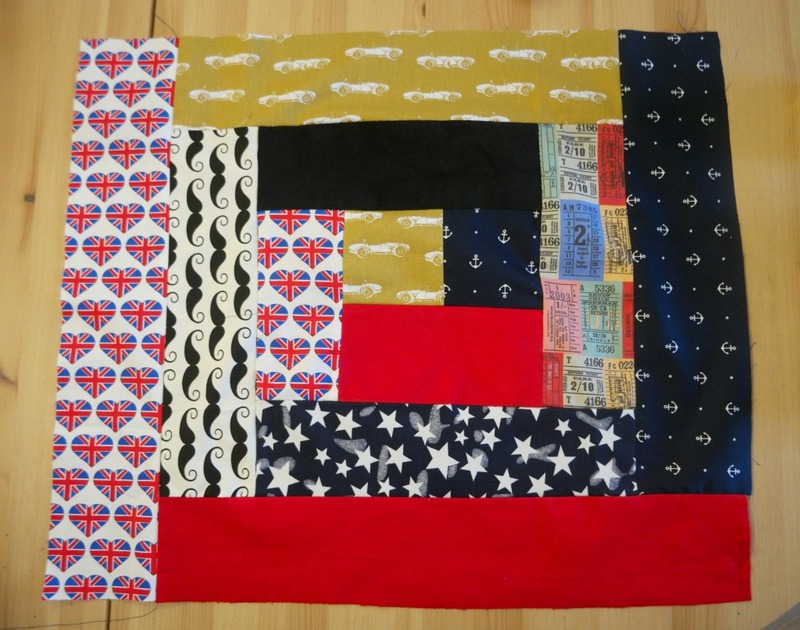 Now that the planning’s done and the bits are prepped, you can get sewing your patchwork quilt! The next post will show how to sew the log cabin quilt block.